When I cruised Hawaii last month, all I really wanted was some fresh fruit and fresh fish. I thought the cruise ship I was on, which traveled from Hawaiian Island to Hawaiian Island would offer such things. But what I found on board were canned peaches and mandarin oranges. Granted there was the occasional pineapple slice and on the last day, some drinks served in hollowed-out pineapples, but I had expected more. So on each island stop, I went in search of traditional cuisine. We spent a beautiful day in Kona. We drove past lava fields, visited a green sand beach (where I found no green sand), saw the southern-most point of the United States, touched the sand on a black sand beach, and wound up famished. We had tendered from the cruise ship to the island and were under strict time constraints. 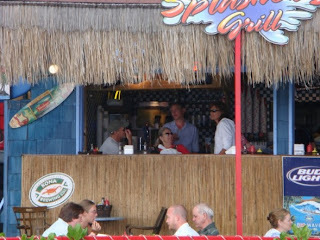 Just across from where we needed to board the tender boats, we found a small restaurant called Splashers. They had fish sandwiches on the menu, and we were sold. We placed our order to go, raced over to the tender boats, and endured other passengers' inquisitiveness as to why we were bringing food back onto the boat with us (it must seem odd to buy your food when you're on an all-inclusive cruise). One bite of the sandwich made it clear as to why it was worth forgoing boat food that afternoon. We sat by the side of the onboard pool and savored our lunch. Made with fried and lightly battered ono on a fresh roll, it was the best fish sandwich I have ever had. 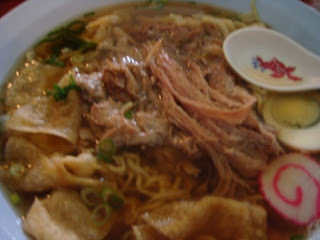 One thing I had read about in a few guidebooks was saimin, a traditional soup. I had been looking for it on every island and finally found it on Kauai. That morning we had driven all the way to end of the road to go the beach. After tiring of basking in the sun and listening to the crowing roosters, we headed back down the road. Eventually, I saw a small restaurant advertising saimin. I convinced my travel companions that we should stop and have a small bowl of soup to take the edge off while we searched for the fish tacos. Well, we soon found out saimin does not come in small bowls. My dad and I ordered the saimin with pork, my mom got it with chicken, and my friend Erin ordered it with tofu. Our waitress soon placed the oversize, steamy bowls before us. My dad had not been impressed with any of the food we had encountered thus far; he cleaned his bowl... and then finished what my mom had been unable to. The broth was flavored just right, and mounds of pork settled on top of noodles, bok choy, and dumplings. I'll forever be searching for a soup as good as that one. 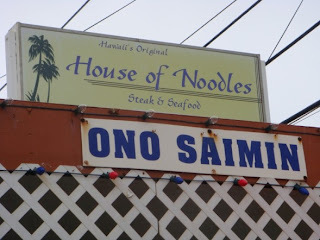 And if I ever make it back to Kauai, I'll definitely be stopping in for a bowl. Perhaps Roy's is a touristy place to go, but as he's one of Hawaii's most-famous chefs, I wanted to sample some of his dishes. I couldn't leave without doing so. I spent my last day in Hawaii swimming in Waikiki Beach, then got cleaned up and packed up, and wandered around town with my parents and Erin. When we started to get hungry, I suggested that we try to find Roy's or Sam Choy's, as I had heard a lot about both places and chefs. We hiked all the way over to Sam Choy's to discover that on Sunday afternoons, they offered only a buffet. I would have liked to have had the opportunity to order off the menu there, but as it was the last day, that wasn't going to happen. 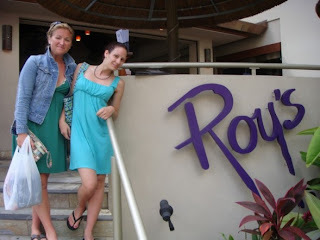 So we all trekked back and went in the other direction and wound up at Roy's. We sampled various appetizers: tuna, crab cakes, butterfish, and if I'm remembering correctly some spring rolls and potstickers. All these sound pretty basic, but it was the things they were served with and the way the flavors combined that made them so delectable. And perhaps the strong drinks we had with them... and the fresh pineapples soaked in Malibu Rum and Stoli Vanilla. We also went to Cheeseburger in Paradise for our first breakfast. I bravely ordered an omelette with Colby Jack cheese, chorizo, and pineapple. I wasn't so sure about the pineapple and egg combination but was very pleasantly surprised. 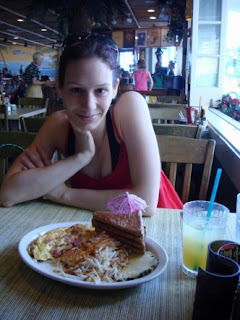 And we had breakfast at a place, I think on Kauai, where I ordered french toast and discovered how wonderful coconut syrup is. I later bought some at an ABC store to bring home with me. And we had some of the most delicious, moistest banana bread in Maui. I wish I had been able to spend more time on each island, trying the local flavors. If I ever return to Hawaii (which I hope I will someday), I plan to visit each island, rather than cruise, so that I can wander around and try different places and not worry about having to catch a boat. Have you been to Hawaii? 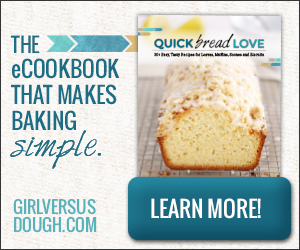 Do you have any memorable food experiences to share? Is there somewhere I absolutely need to try should I return? I'd love to hear your stories too.